Web School- School Management Software, Restructuring an educational institution, on the verge of possibilities, with our cutting-edge technology. Digitizing the scholastic institutions to survive in this Internet era with a myriad of benefits to excel in academics as well as management. Our guaranteed and stable streaming over any browsers helps administrators to access or modify data from anywhere at any time without interruptions. Regardless of the shift among Chrome, Firefox or Explorer, users can access our school management software at the perfect quality. If you are ready to take part in the digital school revolution, then this is the right destination for you. Web School ERP can deal with all the tasks that you need to face in an educational institution in its longest run. Our expert team can offer you the best product that you are looking for and offers full control over the system with its user-friendly feature. Providing a brand new educational culture to all the schools across the world is the inspirational factor behind the development of this solution. Realizing all the practical challenges needed to face in the running of a school has made us go for such a school management software, which can assure you the best experience in your choice of work. Our customer service personnel will be available round the clock to hear client issues and resolve them at the earliest. We are much pleased to work on any of your needs regarding our school management software. With Web School ERP, managing an educational organization is made easy at any time. The smartphone-friendly design lets administrators view or edit the institution data anytime over the phone. 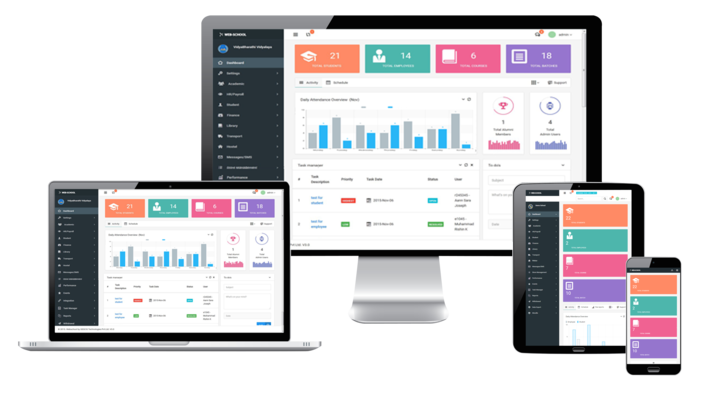 This school management system software has been proven to be highly responsive to iOS, Windows and Android phones. As people nowadays prefer more on phones and tablets these advanced features helps your Web School ERP with the added advantage of its accessibility. We will be always bound to be reliable and committed in contributing towards the future of academic management. With the refined content and design, we keep up our standards, and with updated security protocols we ensure confidentiality of our client data. Unlike many other educational software, the WebSchool ERP stays optimal for providing add-on customization features that let data to be updated frequently. Multiple access and control to our school management system software enhance the whole administrators to get confirmed with the updates. Clients have provision for updating our software for a better reference experience in the administration and control of institution data. In account with changing systems or curriculum in the education, users have options for making changes at any time. The security and privacy is no way compromised, so as to ensure that only the right user is having the control of this institution administration software. The vast possibility of the administrative database that we let out for your institution management solution comes in various packages so as to match both your technical requirement and budget range. We ensure best and secure backup for your school records at the best prices. See what we can do for your Institution! The major feature of the student module is that it is designed in a way that it prioritizes all the necessary needs of the pupils. They can securely access this portal with their unique login password to stay updated with the daily class timetable and teacher allocations. The student can also get notified with exam schedules, disciplinary warnings, fee payment details, library records or any alterations in class systems. To know details on book borrowings from the library or availability of school buses, students just need to access this module. We realized the need for a specialized access portal for the teachers as they are an integral part in the education system. The Web School ERP, teacher module features the submission of class attendances and progress reports of students. Teachers are provided with passwords to access this portal so as to ensure security. The ERP is designed so as to reduce the stress and efforts of teachers in managing the student records and academic curriculum’s. As the smooth functioning of an educational institution is the responsibility of the administration quorum, our school management system is included with enhanced access to the members in the administration panel. In this module, they can publish official announcements and notification for teachers, students, and parents. This portal can be used to validate the performance and financial growth of the entire academic system. This also lets them to review and manage details of payrolls, library, transportation, and examinations. With the parent module in Web School ERP System, our clients are ensured by the fulfilled quality of the educational establishment. This feature is made so as to satisfy the important duties of the parents, in monitoring the performance of their children in both the academics and the extra-curricular activities. The parents can keep following students attendance lists, fee payment details, class schedules, exam timetables, progress reports and all other day-to-day happenings in the school.